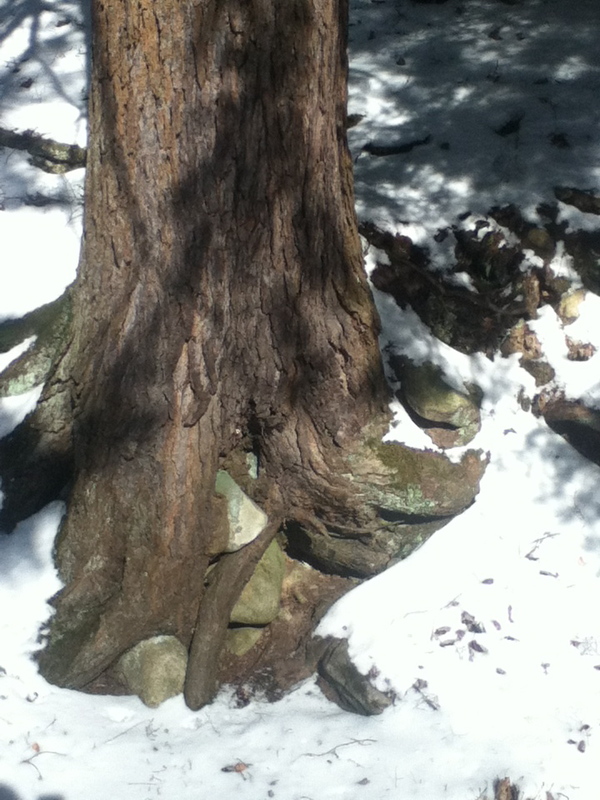 We went back for our third annual long winter weekend at World’s End State Park, a beautiful area east of Scranton, PA and very close to Rickett’s Glen and Loyalsock, two other PA state parks. I have written about the other trips there, and this one was similar. 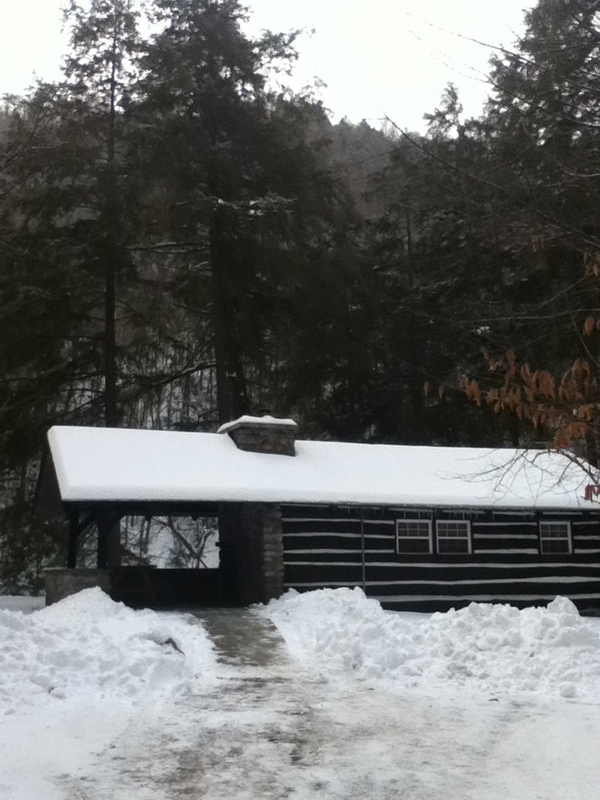 Beautiful hills, ice waterfalls, cozy cabins heated by woodstoves, eight or so families to play with. One thing I hadn’t mentioned in other posts about World’s End is the Cabin Notebooks – a real treasure!! 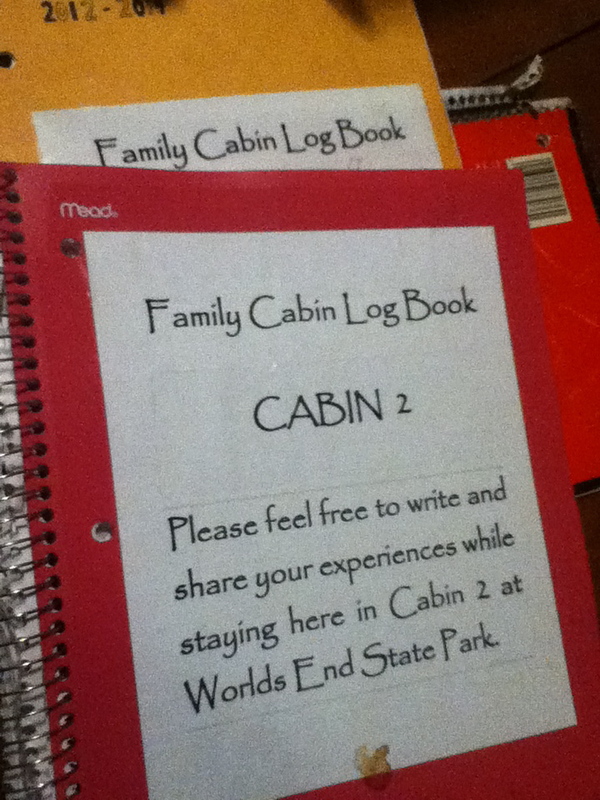 Each cabin has several notebooks going back at least 10 years. People write whatever they want in them about themselves and their time at World’s End and the cabin. There are mentions of hiking, wildlife, mice in the kitchen, weather, marriage proposals, family traditions, alien abductions, the lack of cell phone service, you name it. Some people draw or write poetry. 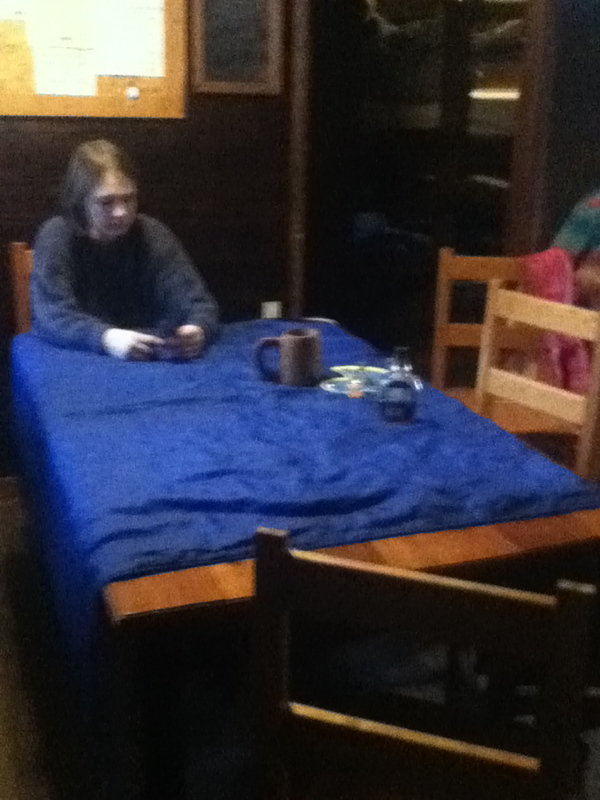 There are teen laments about the lack of Wifi. It is a rare and lovely look at people’s experiences and their handwriting, too! I finally made an entry one night about the group we were with, our times hiking and eating and little things like that. 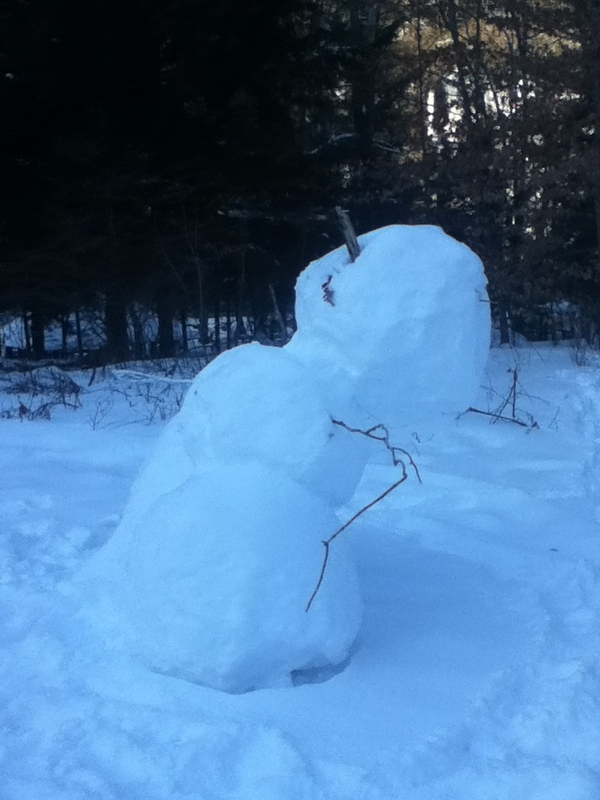 Cabin notebooks, and another creative expression- a snowman stabbed by an icicle! It’s a wonderful place, and I’ll share some more pictures because there’s not much more to say. We went back to the End of the World!!! Damn the torpedoes, the snow, and the subfeezing temperatures, we went out there anyway. 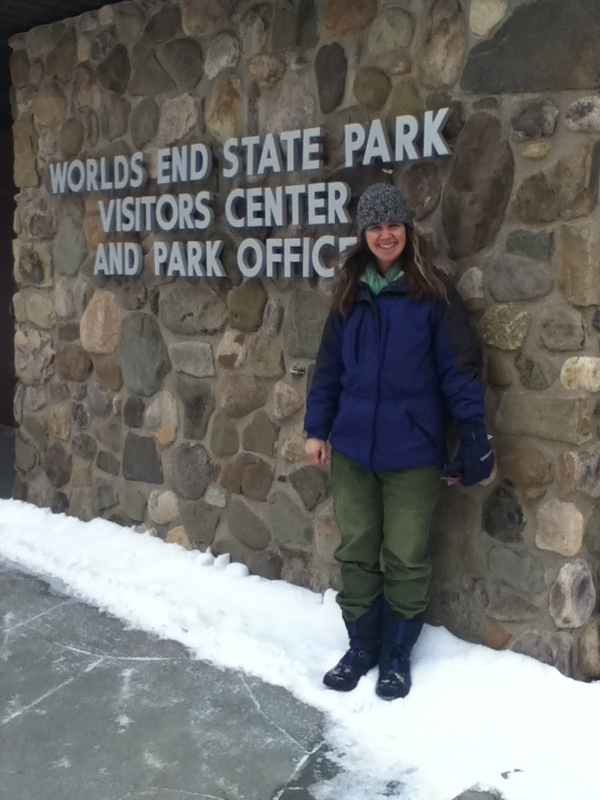 World’s End State Park was new to me last year. Friends of ours arranged the trip again, so again we went. Of course with the arctic front business this year, the temps were lower and the snow was deep. 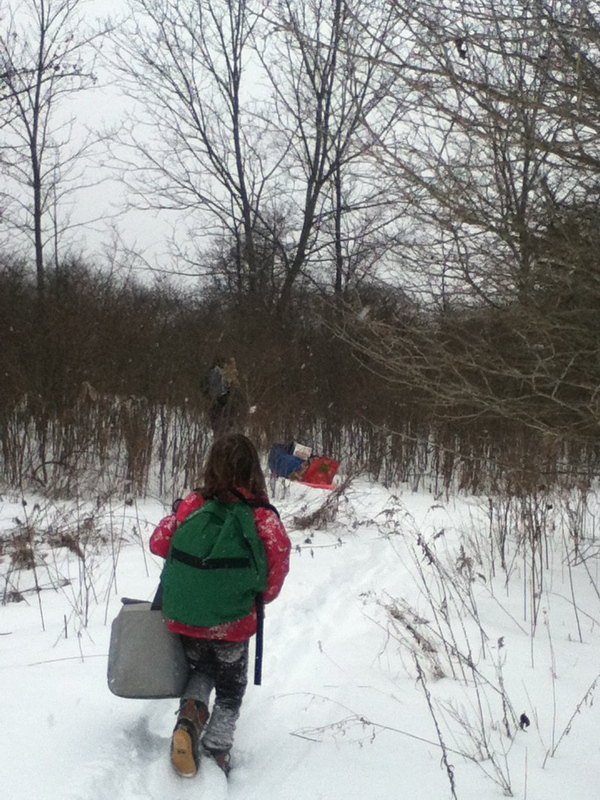 Several trails were not usable, especially the one we were on last year, Butternut trail. 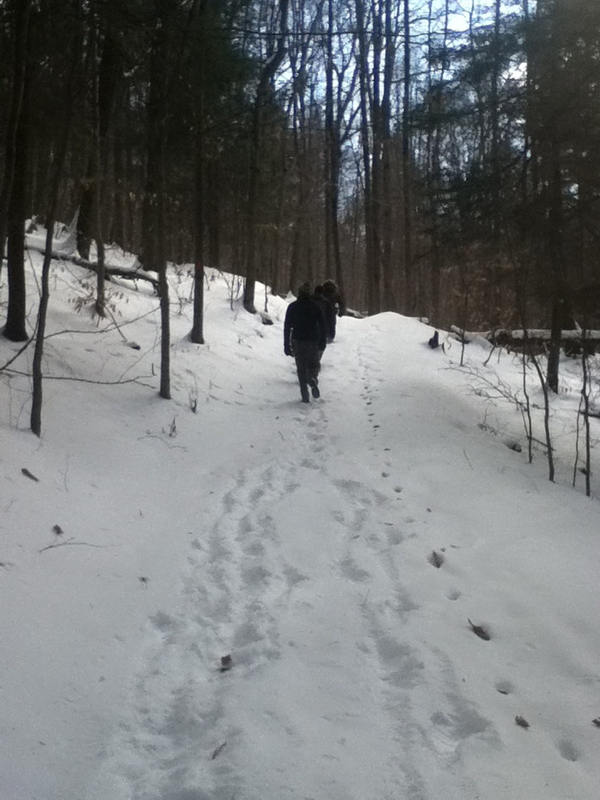 This steep trail goes up and down a gorge and was likely treacherous in the ice and snow. 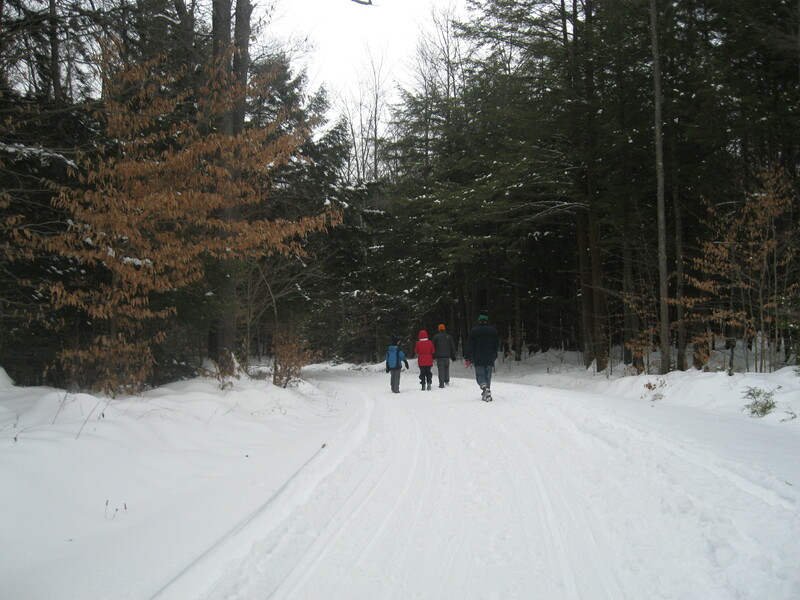 Instead, we went on a xc-ski/snowmobile trail that was groomed and walkable. We walked about 1.5 miles in on the High Knob Overlook, but didn’t quite make it to the overlook. 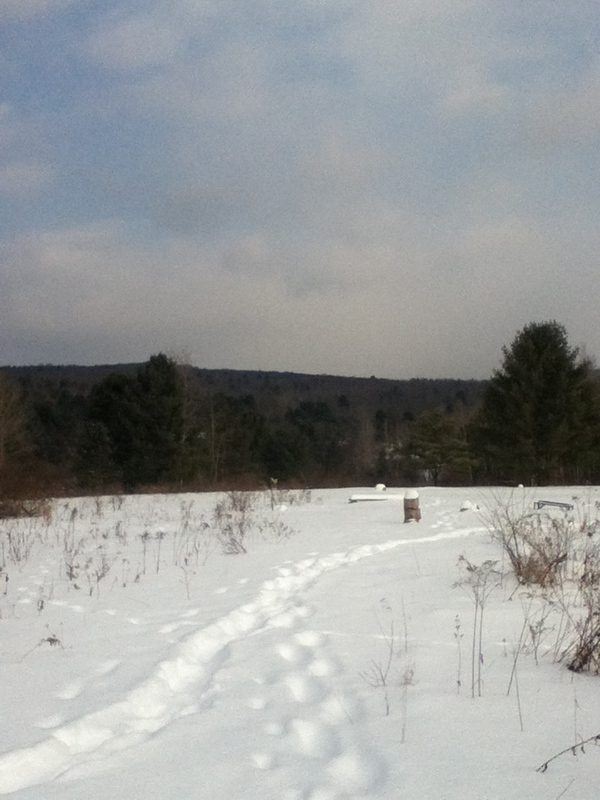 We were passed by snowmobiles once or twice, also some xc-skiers swooshed by and I was wishing for xc equipment myself. 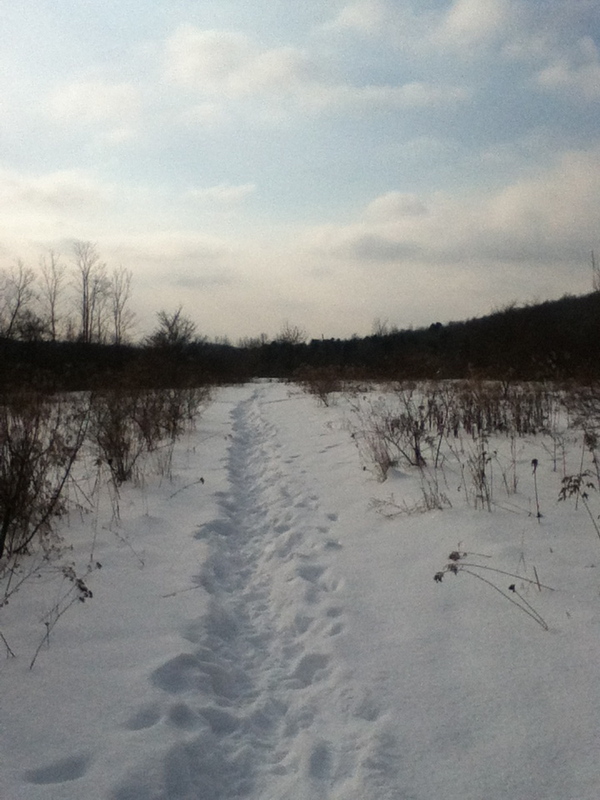 It was a perfect day for it, and the trail was beautiful. 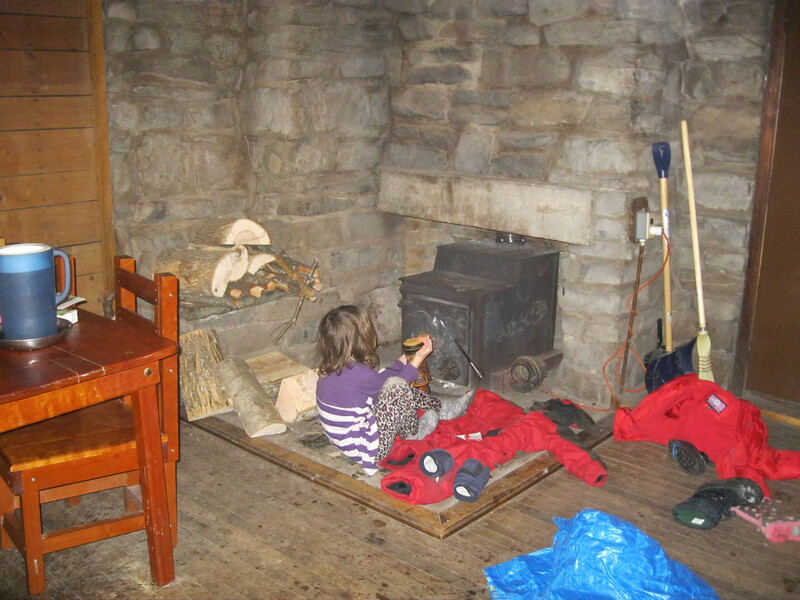 Our cabin was cold at first, but we had a roaring fire in little time and everything warmed up nicely. Our group had six cabins and arranged for wood to be delivered to each one, so we just had to stack it and keep the old woodstove burning. This did involve getting up to stoke the thing several times at night, lest the reader overly romanticize the scene. It did get to the single digits, mind you. Those cabins are just so darn cozy! 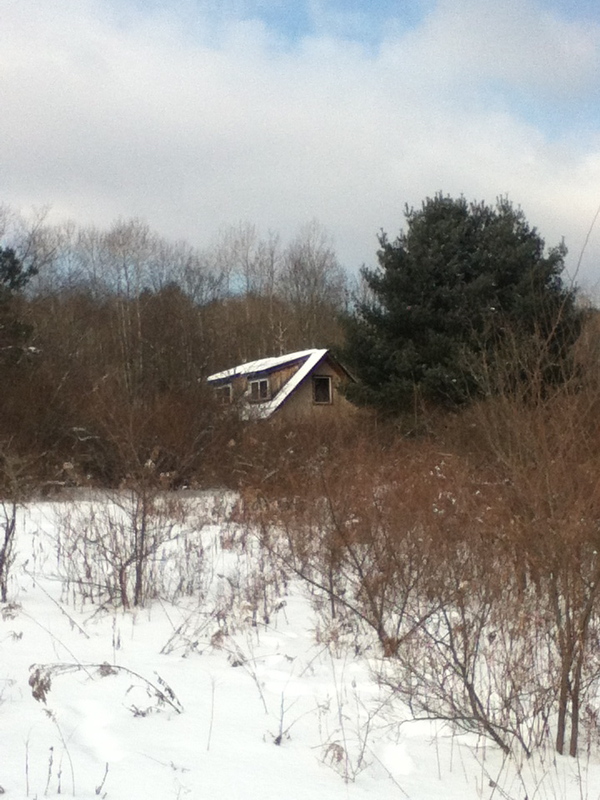 Each one has a stone fireplace with woodstove, lights, a refrigerator, and a cooking stove. No water/sink/bathroom, but there are several nice bathhouses so no cabin is too far from one. Our cabin, #8 same as last year, inside and out. We had a feast one night with all the families and way too much food, and made s’mores on one of the outdoor fireplaces. Our cabin had one of these, as did several others. 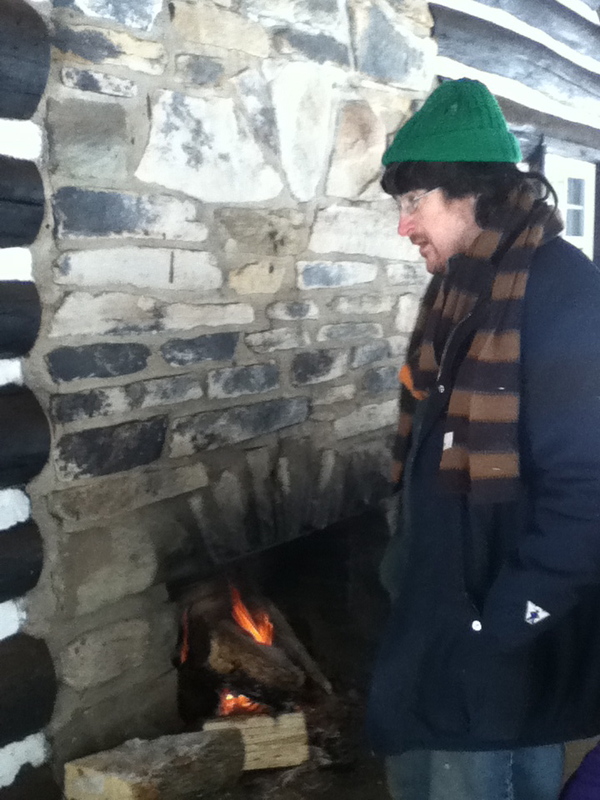 The stone fireplaces are really beautiful. 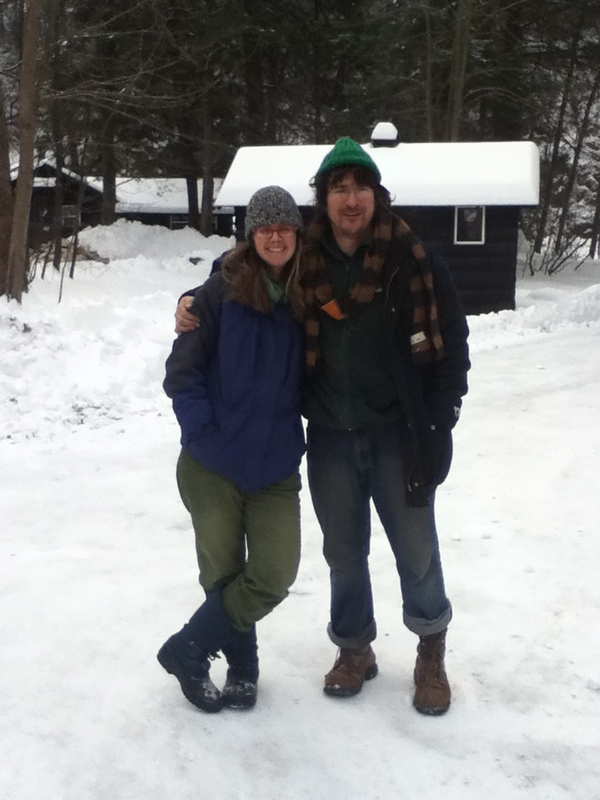 We headed to our Ithaca cabin afterwards. 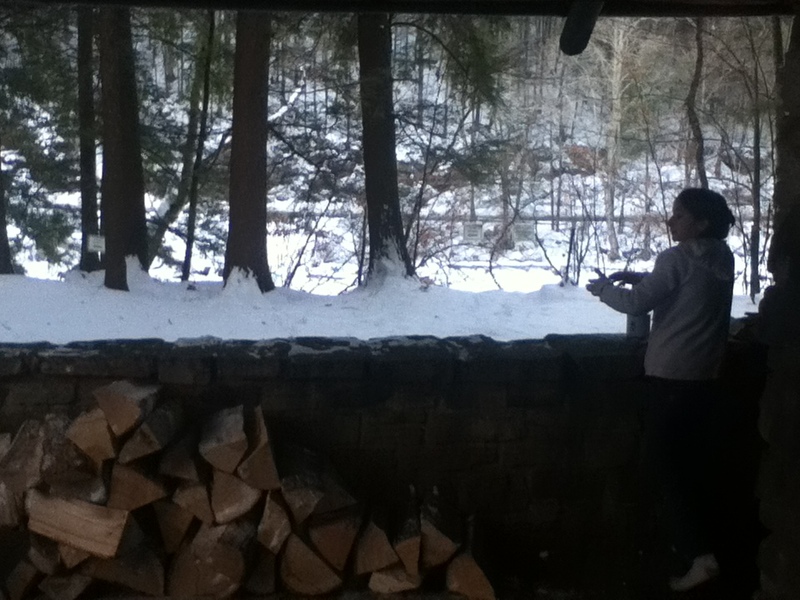 It was cold and snowy the whole way there, and cold and snowy at the cabin. Our heater was having problems so there was a lot of co-sleeping under as many blankets as we could find! 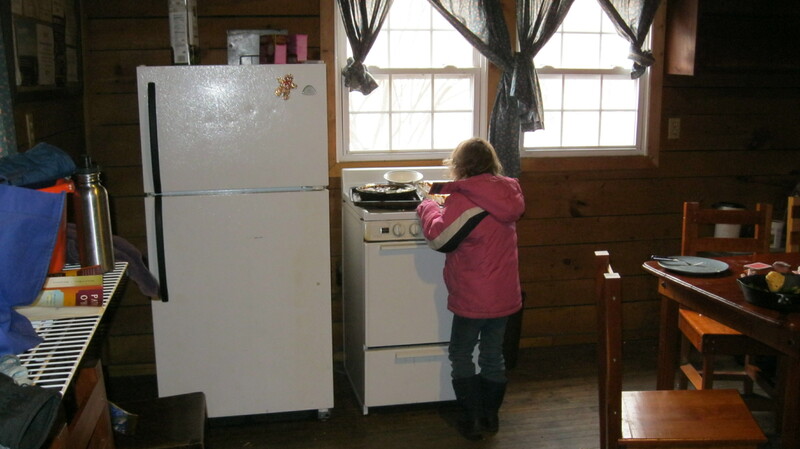 Our cabin has passive solar warmth and also retains heat well, so we used the oven to warm it up. 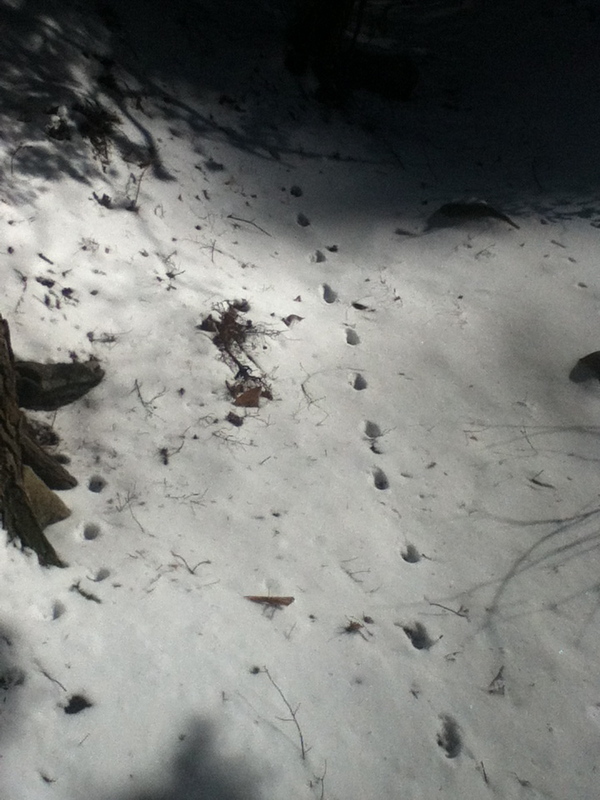 We were happy to get above freezing and see the snow from our boots melt after a few hours. 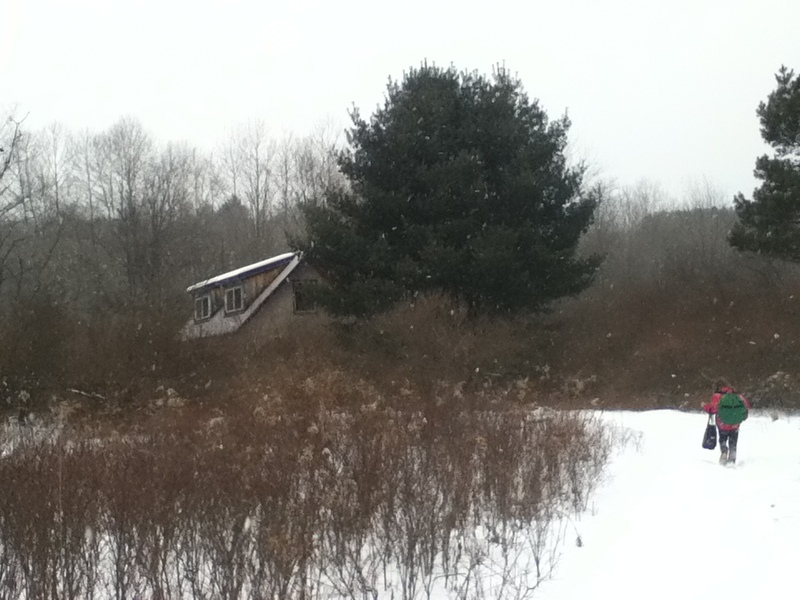 We also walked on the pond and walked around the property a little, but the more popular pastimes were drinking tea and hot chocolate and snuggling under blankets. I made it through more than usual of the Sunday New York Times, which was nice. We really didn’t do much other than read, cook and eat, and enjoy the coziness of the fact that we were slightly warmer than the outside. Just looking out the window was bliss. This really is a great winter! To heck with anonymity for a minute, Mr Fantastic’s first name the unusual Serbian moniker “Milan” (rhymes with smilin’, as he likes to say). Well, passing through rural upstate Pennsylvania, we came upon a small town with that same name! And it said ‘Pa’ afterwards, for the state of course, but much like our man who is of course a proud Papa. 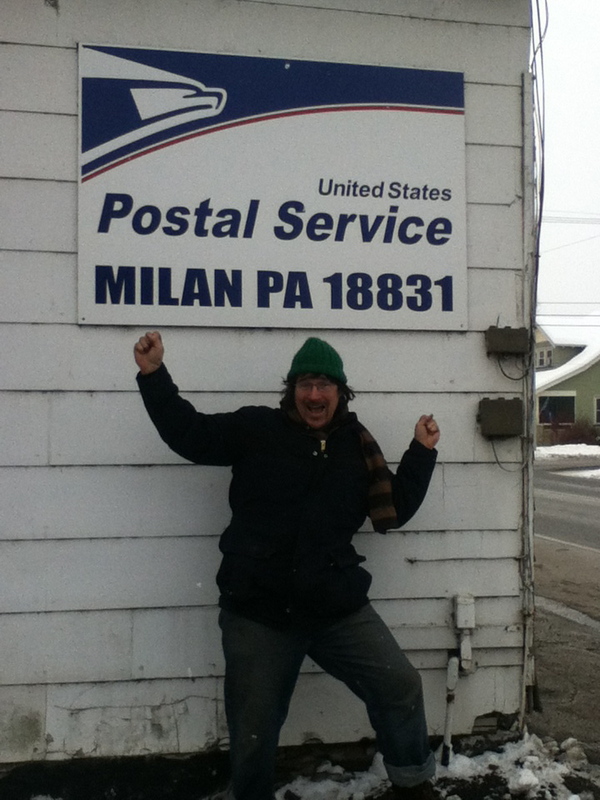 We took a million pictures by the post office, unfortunately closed on Sunday, but could not find a Milan, Pa. citizen to tell us their pronunciation. I thought this article might be helpful, but it didn’t mention the PA town. 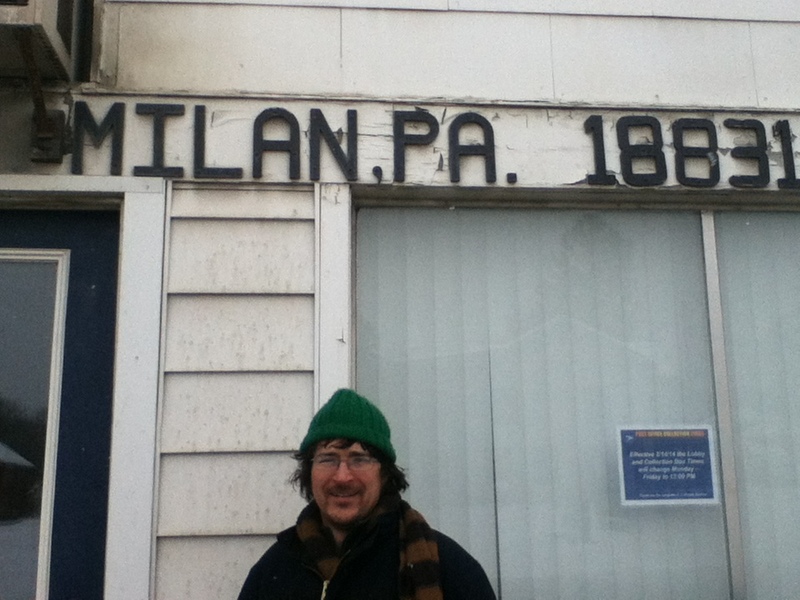 Likewise this one on the name, this one that mentions a Milan in Michigan, awww I give up. So, what’s your opinion on those glass insulators from old telephone poles? Well, my late mother-in-law collected them and we are still in the habit of stopping by the side of the road once in a while in memory of Grandma Judy if we think we can grab a few. 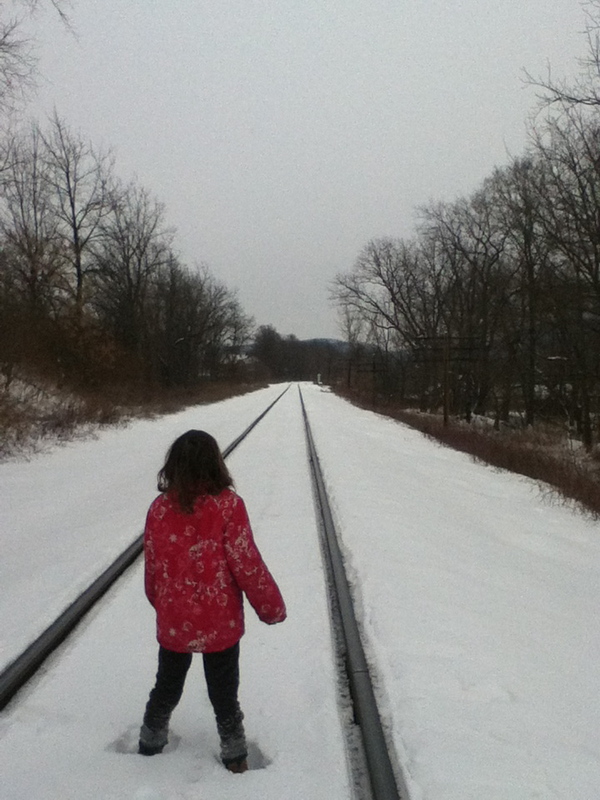 This time we didn’t get any, but a little adventure walking on snowy railroad tracks for questionable reasons is always a plus. Being a nonconformist and a bit of a daredevil, she would have approved, we think. 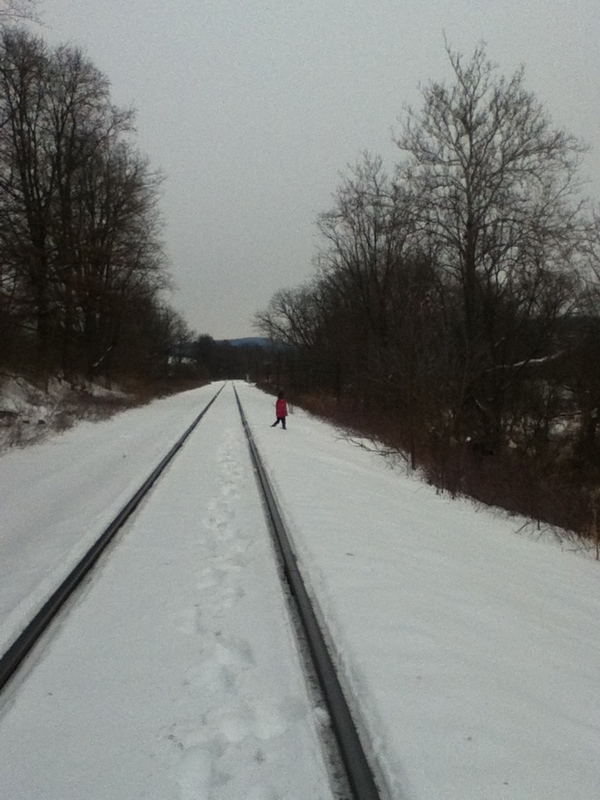 It appeared that the tracks were in use based on the fact that they did not have snow on them, but we did not see any trains as we walked there and later drove along that stretch of track for a while. 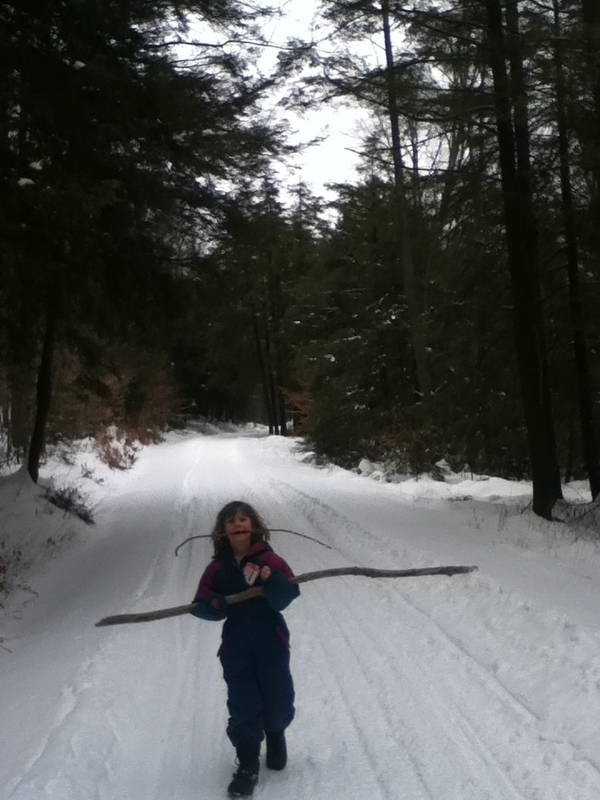 So back we went to the East Coast blizzards, which rage again as I write. The kids want to watch a movie so I’m signing off until the next adventure! How often can you say you went to the end of the world? 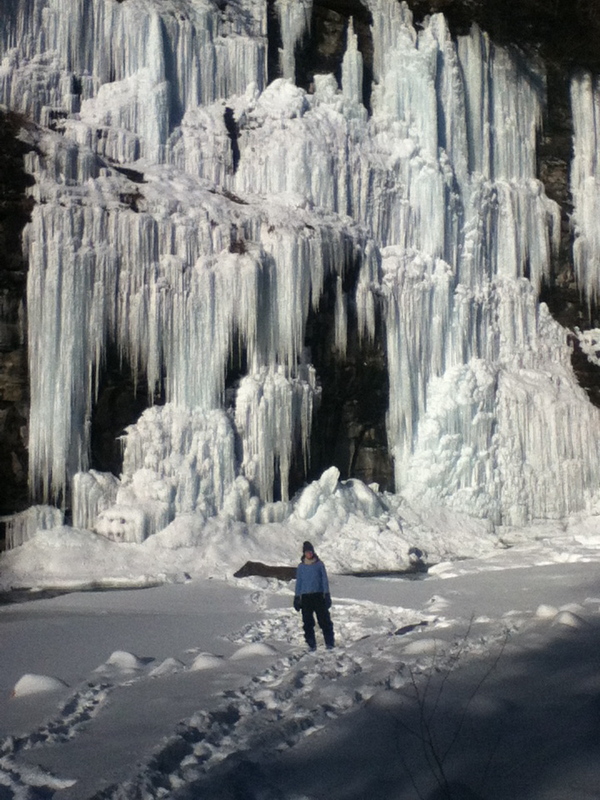 It seems we were there this past winter, stoking the fires, climbing the frozen waterfalls, and playing a fair amount of Uno. The place has been called Whirl’s Glen and Whirl’s End in the past, apparently with some controversy until the Geographic Board stepped in. Did you even know we had one of those? I sure didn’t. Some friends organized this trip to the rustic 1930’s-era cabins of World’s End. Yay, Civilian Conservation Corps! 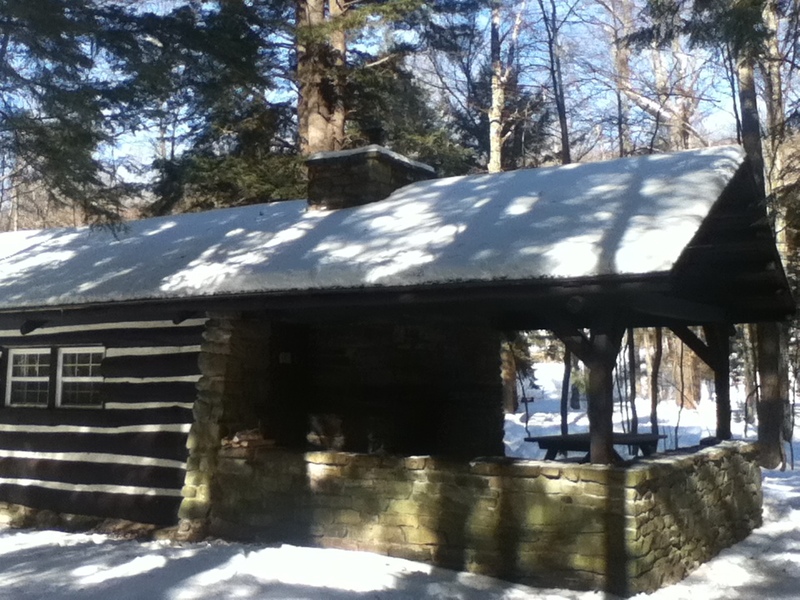 They built some sweet, long-lasting cabins at a lot of parks. 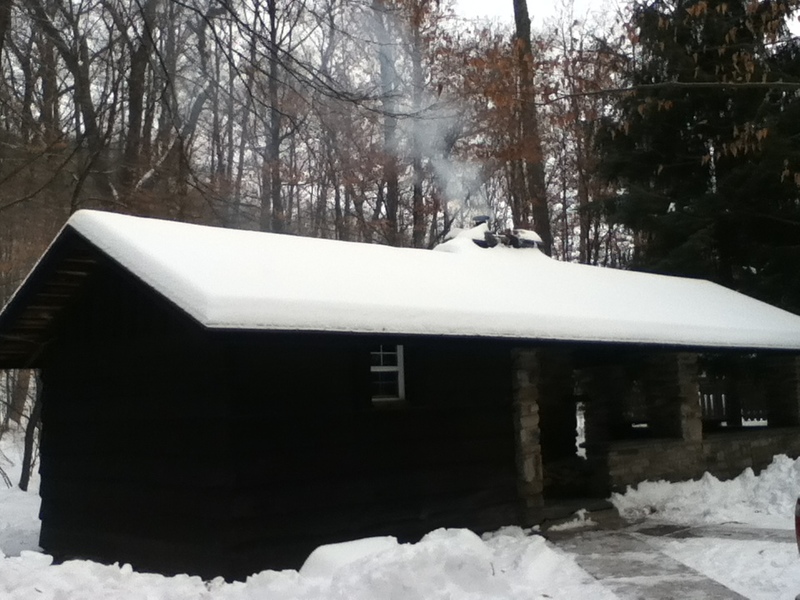 These cabins were beautiful, all wood with stone fireplaces, and we ordered a cord of wood to heat the 5-or-so cabins we occupied that weekend. It was more than enough. The park supplies a small amount of wood, then you bring your own or order for delivery from a local supplier – kind of a set-up for us city folk but we didn’t mind. 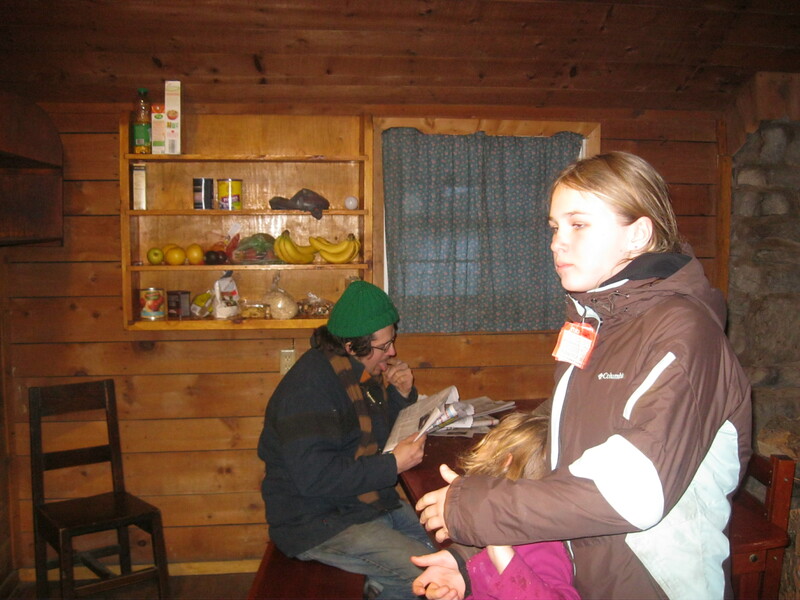 The cabins are rustic, but somewhat modern, too, since each did have electricity, a stove, and a refrigerator. Shower/bathroom facilities are shared, and the building we used looked recently renovated with nice tiles, plenty of hot water, flush toilets, and a good heating system. The cabins had different configurations. 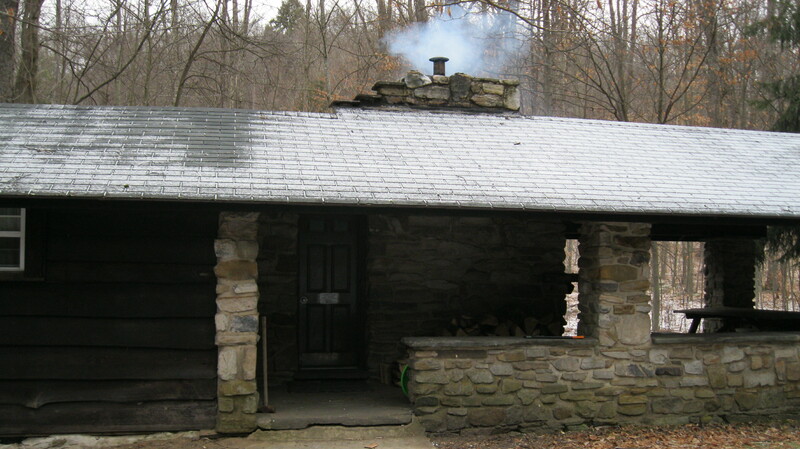 Our cabin had a large porch with outdoor fireplace (above photo, picnic table on right faces outdoor fireplace), which we made use of one evening for roasting marshmallows. 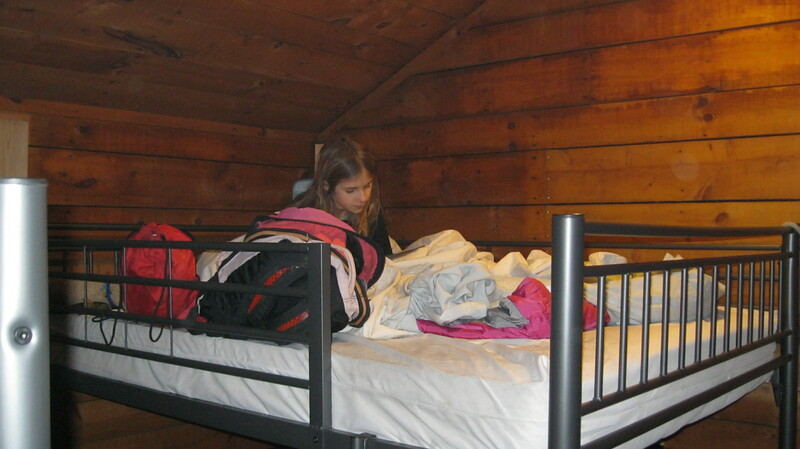 The inside of the cabins had the kitchen area with appliances and large table, and separate sleeping room with double bunk beds. 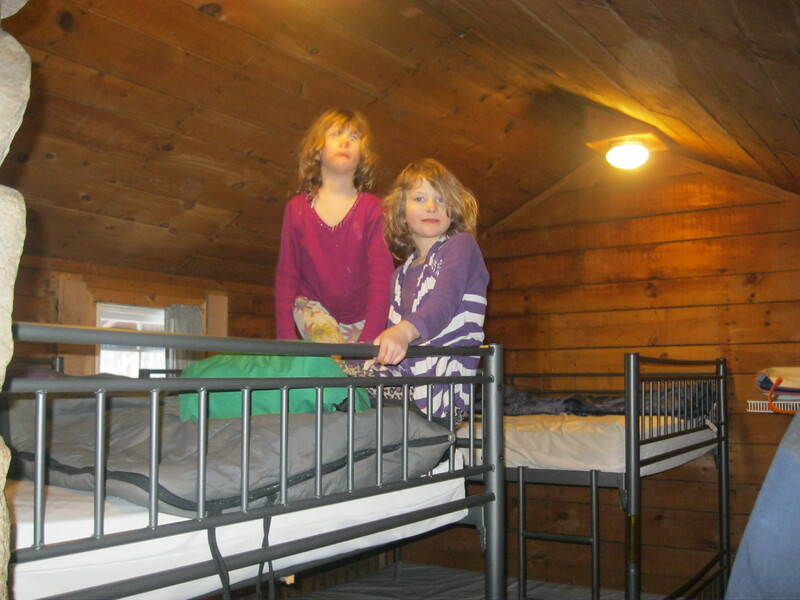 I point out the double bunk beds because when they say a cabin sleeps four people, they mean one bunk bed with two double beds. 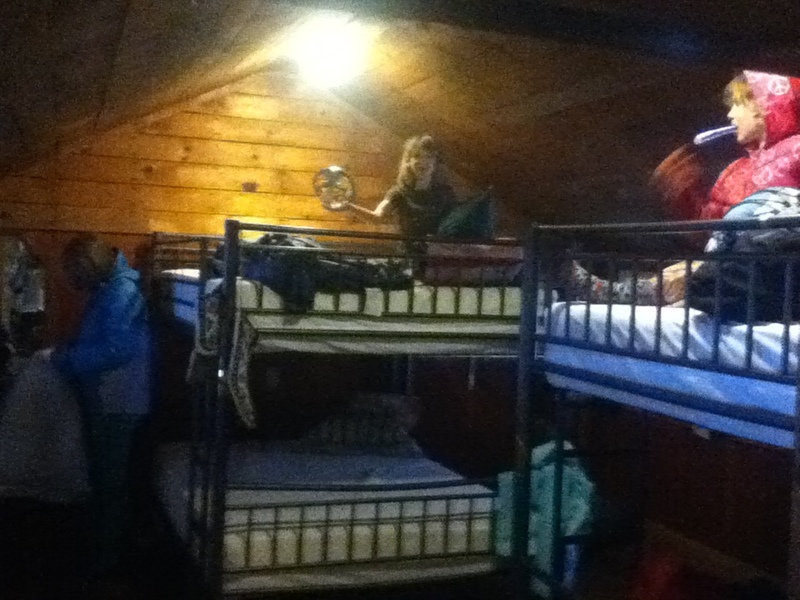 We had two bunk beds, thus our cabin could hypothetically fit 8 people if everyone sleeps two to a bed. A quirky thing about the cabins was the guest notebooks where visitors could write whatever they pleased. I was amused reading about people’s experiences with bad weather, bugs, wildlife, and (one hopes) fictional alien abductions. 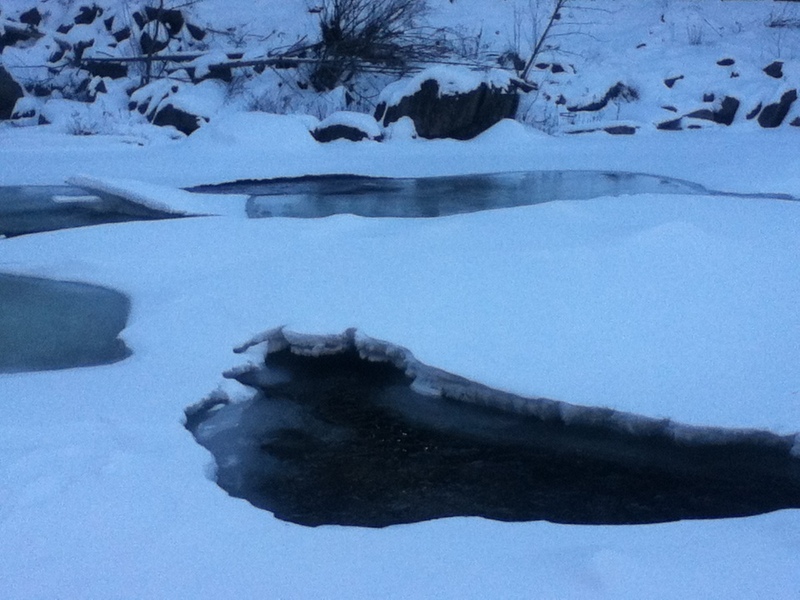 We took several hikes at World’s End, also we spent time by the river near the cabins. Other than that, we ate like gluttons, made and maintained fires like pyromaniacs, and played cards like gamblers. 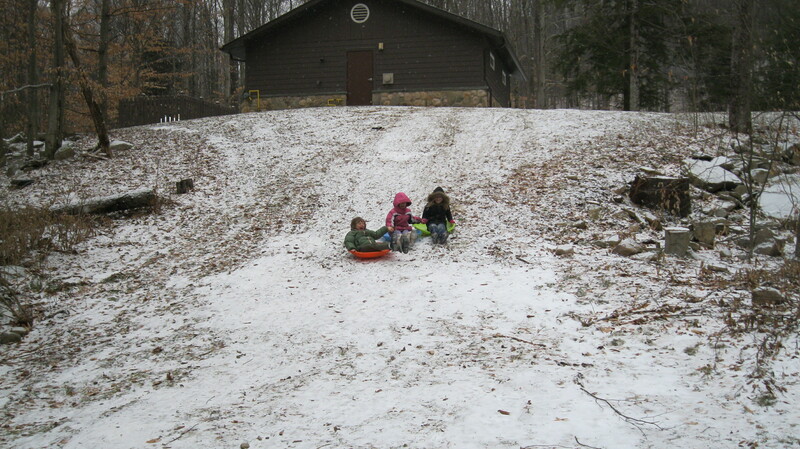 The kids did some sledding on the hill between cabins. 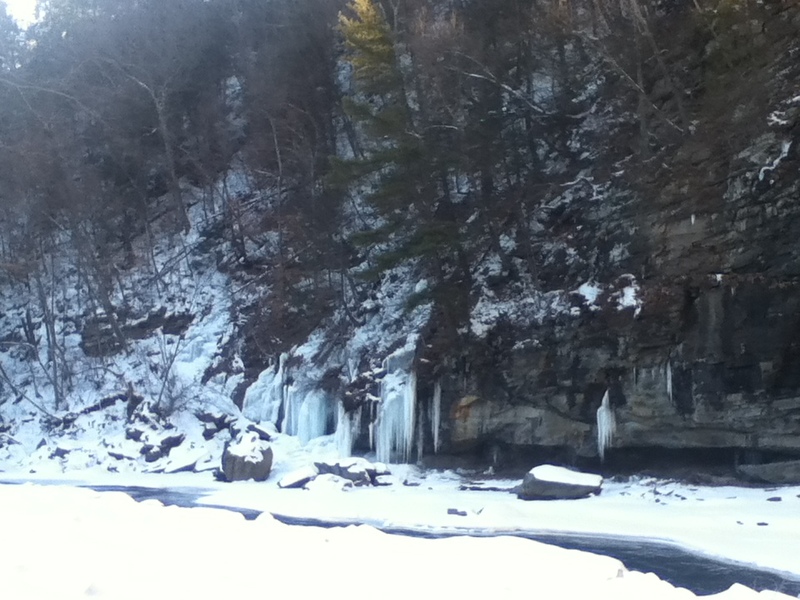 The river is actually called Loyalsock Creek and has beautiful layered rock cliffs next to it at many points. These were festooned with icicles while we were there midwinter. 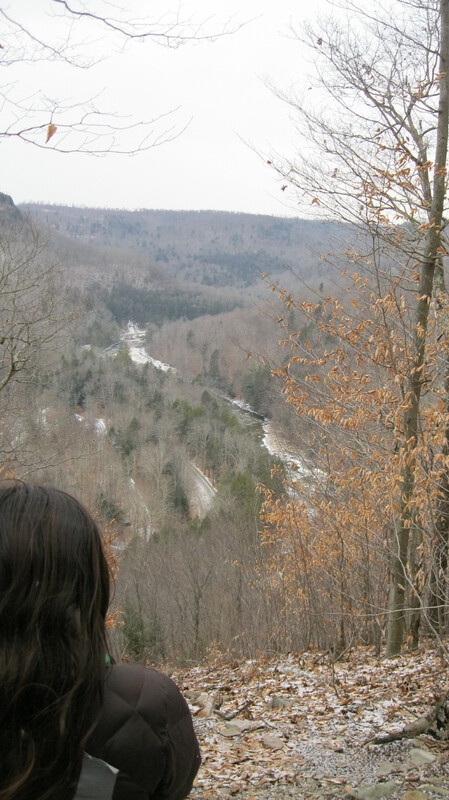 We hiked the Butternut Trail and the views were excellent. There was a lot of climbing, but the kids were in good spirits for the most part, I think there were about 12 kids with our twins being the youngest at 6 years old, and they all did well. 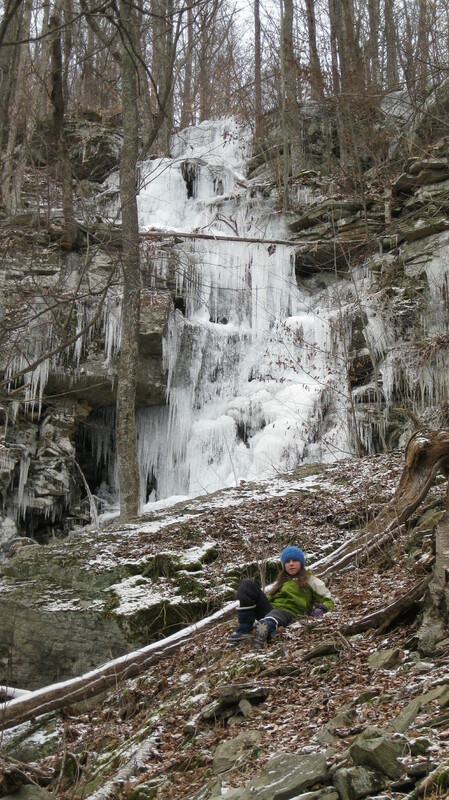 Off the trail there were frozen waterfalls to explore. I’d love to go back in the summer because it looks like there are swimming areas, or in the fall to see the trees in their autumn glory. One downside is that the cabins are close to the roads, both the park road that goes to the cabin and a local road that is on the other side of the river. I would have preferred a little more isolation, however it did make getting our gear in and out easier. I also would like to have stayed longer than 2 nights to see more of the park and do more hiking, but I am grateful to have been to this park because I had heard about it for years and it was a lovely area.